Arino Maker is an Event Course in Super Mario Maker designed by Shinya Arino of the Japanese TV show GameCenter CX, and was released on November 4, 2015. It is one of three Event Courses to unlock the Arino KACHO Mystery Mushroom costume upon completion. The level begins with Hard Blocks arranged to read "何点? ", with a ? Block containing a Super Star. Mario can use that Super Star to get past the Big Goombas in the next area, then climb up and hit a ? Block containing a Fire Flower. Mario must then climb back down, traverse some warp pipes, then move across some mushroom platforms and lifts to make it to some Bill Blasters that shoot out different enemies. 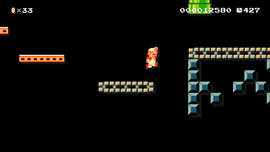 Thwomps and vertical lifts appear in the next segment, along with conveyor belts and Hard Blocks that read "トベ". More Hard Block text up ahead reads "100テン", followed by the Goal Pole. This course was made by Arino KACHO, from the popular Japanese video-game variety-show GAMECENTER CX. Here's a comment from the KACHO himself: "There's more than one route to the end, so try to find them all. If you mess up on the final path, I call it the Bow-Down Goal!" This page was last edited on August 26, 2017, at 09:57.